We are using diaphragm pumps with rotary evaporators instead of using water aspirators. Using the diaphragm pumps saves water and limits release of chemicals into the environment (some solvent fumes can dissolve in the water used by the aspirator). However, it is important that the pumps be used properly in order to have these environmental benefits as well as extending the life of the pump. Below is a picture of a typical setup. Always keep the rotovap vent (A) closed. Otherwise, the air venting through the system from this location will cause some of the solvent vapors to bypass the traps. Heat the water bath (B) to the desired temperature (see Rotovap Conditions for examples of appropriate parameters). Make sure that a dry ice/isopropanol slurry is in the dry ice trap (F) and that the solvent receiving flasks (D, E) are empty. The pump should be off, and a slow flow of water should be running through the rotovap water-cooled condenser (H). In a duel rotovap installation, make sure that the other rotovap has a sample flask (B) and a solvent receiving flask (D) installed. Place your sample in the sample flask (B) and start the flask spinning. Slowly close the pump system vent (I) until you reach the desired vacuum pressure on the vacuum gauge (G) (see Rotovap Conditions for examples of appropriate parameters). Keep checking the gauge (G) to make sure you do not overshoot the desired vacuum. 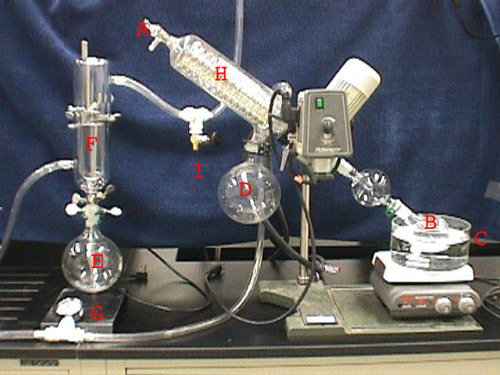 Most of the solvent should condense on the rotovap water-cooled condenser (H) and drip into the rotovap solvent receiving flask (D). A small amount may condense on the dry ice trap and drip into the dry ice solvent receiving flask (E). When your sample has reached the desired level of solvent removal, open the pump system vent all of the way so that the vacuum gauge (G) reads zero. Remove the solvent receiving flasks (D, E) and decant the solvent into an appropriate container. Remove your sample flask (B) and replace it with an empty flask (B). Let the pump run for two minutes with the pump system vent (I) open, then turn off the pump.